Nye is the former host of the children’s TV show “Bill Nye the Science Guy” and a science education advocate; he has spoken out against teaching creationism to children. Ham, meanwhile, is CEO of Answers in Genesis and a believer that Earth is several thousand years old (a movement known as young-Earth creationism). A recent Pew Research survey finds that most Americans (60%) say that “humans and other living things have evolved over time.” But a third of U.S. adults (33%) reject that point of view, instead saying that humans have existed in their present form since the beginning of time. Nye (the 2010 Humanist of the Year and a self-labeled agnostic) and Ham may represent extreme ends of the spectrum with their beliefs, but in between are some other perspectives, which can be somewhat difficult to capture in public opinion surveys. For example, roughly a quarter of Americans (24%) believe in evolution with God in the equation, saying that “a supreme being” guided the process (sometimes called “theistic evolution”). Some evangelical churches reject evolution, including the Southern Baptist Convention – the largest Protestant church body in the country – which supports teaching “Scientific Creationism” in public schools. (Ham’s organization has appeared at the SBC’s annual meeting.) But many other major American religious traditions say their teachings are not in conflict with evolution, including the United Methodist Church, the Presbyterian Church (U.S.A.) and the Roman Catholic Church. Those positions appear to be reflected at least somewhat in our polling. 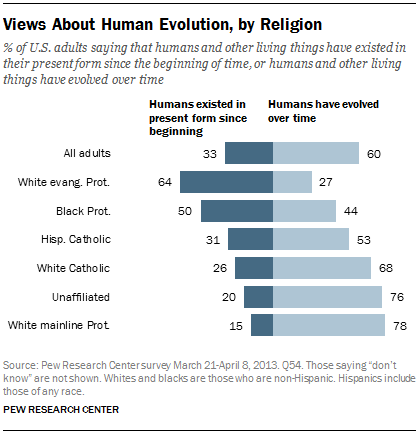 While nearly two-thirds of white evangelicals (64%) say humans have existed in their present form since the beginning of time, 78% of white mainline Protestants say humans have evolved – about the same share as the religiously unaffiliated (76%). 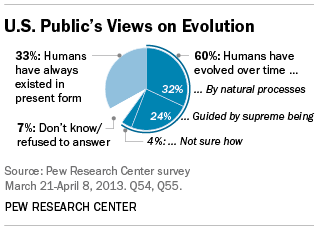 A majority of white Catholics (68%) also believe in evolution. The teaching of the origins of human life in public schools continues to spark debate in several states, including a recent proposal in Virginia.